WASHINGTON, DC, January 7, 2014 (ENS) – A frigid, arctic air mass known as the “polar vortex” will continue to bring dangerous, life-threatening low temperatures and wind chills to parts of the central and eastern United States and southern Canada on Tuesday. Wind Chill Advisories and Warnings are in effect for much of the eastern two-thirds of the United States with wind chill values as low as -20F to -50F possible. Temperatures are expected to begin moderating on Wednesday. 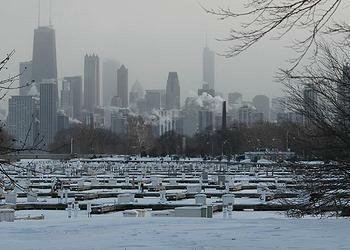 U.S. authorities have blamed a total of 15 deaths on the cold, 11 of them from traffic accidents. Usually thought of as polite, Canadian travelers dropped their courteous demeanor. Police were called to the airport to calm hundreds of frustrated passengers who were verbally abusing airport employees. No arrests have been made to date. 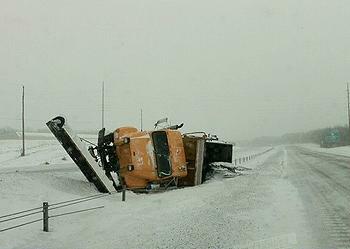 An intense storm hit the province of Quebec Sunday and Monday with snow, freezing rain, rain and high winds. Some areas have experienced extreme wind chills of -43, according to Environment Canada. The coldest air in 20 years has paralyzed much of the Midwest and Eastern United States, leaving thousands without power, causing airlines to cancel more than 4,000 flights, closing highways in many states and halting Amtrak train service on three lines. According to Amtrak officials, some 500 passengers aboard three Amtrak trains were trapped all night in a remote part of northern Illinois because of blowing and drifting snow. The trains were stopped late Monday near Mendota, about 80 miles west of Chicago, as their wheels froze to the tracks. The dangerously cold air mass over the Midwest has begun to impact the Eastern Seaboard and the Gulf Coast. This morning, temperatures fell below freezing along the Gulf Coast from eastern Texas to western Florida. The extreme cold is due to a “polar vortex” meteorologists say. 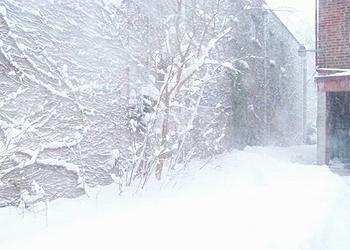 “A polar vortex is a large pocket of very cold air, typically the coldest air in the Northern hemisphere, which sits over the polar region during the winter season,” explains AccuWeather.com’s Jillian MacMath. A large, powerful high pressure system originating in the Eastern Pacific is stretching to the North Pole, shoving the vortex farther south than is typical, allowing it to settle in Canada and the United States. “The high pressure system, paired with the extensive snow cover over southern Canada and the northern United States, is allowing the air to stay very cold, according to Anderson. The vortex is threatening temperatures as low as minus 30 degrees Fahrenheit in the Plains and in the negative 20s and negative teens farther into the Midwest. According to the National Weather Service, the Upper Midwest, where some of the lowest temperatures are occurring, is currently more than 98 percent snow-covered. The Upper Great Lakes region is 100 percent snow-covered, and the Midwest is more than 76 percent covered. Last week winter storm Hercules unleashed heavy snow and ferocious winds on the Midwest and Northeast, before exiting New England late Friday, leaving up to two feet of snow in its wake. In Indiana Governor Mike Pence has declared a state of disaster emergency for 29 counties. “I want to recognize the heroism of our state’s first-responders and emergency personnel who have been working throughout the night and day to rescue motorists and provide critical services and assistance in some of the most difficult conditions imaginable,” the governor said. Illinois Conservation Police Officer Trent Reeves rescued seven people and two pets that were trapped by snow drifts along Route 47 north of Mahomet. Emergency vehicles could not reach them, so Officer Reeves traveled by snowmobile and on foot to rescue the stranded individuals and deliver them to emergency vehicles. All of those rescued are fine. The Illinois Department of Public Health and the Office of the Illinois State Fire Marshal are warning about the dangers of carbon monoxide poisoning. Carbon monoxide is produced whenever fuel such as gas, oil, kerosene, wood or charcoal is burned. If appliances are not working properly or are used incorrectly, dangerous levels of carbon monoxide can result. Symptoms may resemble winter flu or food poisoning, particularly in children, and include headaches, dizziness, nausea, and lethargy. Higher levels of exposure can cause fainting, marked confusion and collapse. If exposure continues, death can result. If your carbon monoxide detector alarm sounds, call 911 and leave the area immediately. Affected individuals should be led to fresh air. To prevent carbon monoxide poisoning, authorities say, do not use a gas oven to heat your home, even for a short time; do not burn anything in a stove or fireplace that is not vented; do not use gasoline-powered engines in your house, garage or other enclosed spaces; and do not use a charcoal grill, camping stove or Sterno-type fuel for cooking indoors, even in a fireplace. When the strong air from the Eastern Pacific weakens and falls apart, the polar vortex will retreat and go back into place near the North Pole, meteorologists say. Until then, temperatures across the northern Plains and Midwest will continue to be life-threateningly cold, shattering some all-time low record highs.